It is sad, I am sitting home working on projects on a Saturday night and my cats are having more fun with their own partying, haha. Dora and Izzy can go into high gear and go tearing through the house chasing each other. 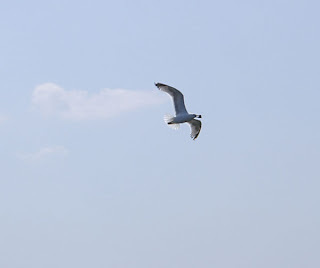 They run under, across, through and flying over everything. I thought I would treat Dora with some catnip, like she needs it;) So tonight you can enjoy seeing the many faces of Dora on catnip, though it would be a lot funnier in video. 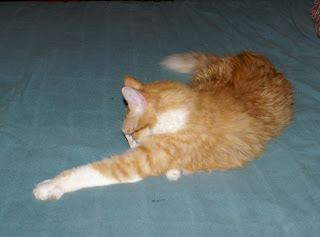 For starters, I put it on the bed, so I could take pictures, luckily I have an old spread on it until I finish my quilt. 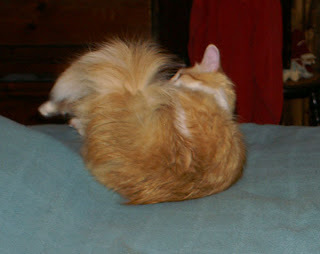 The first thing dora does is dive in and roll, smelling and eating her favorite treat. You wonder why Izzy is not joining in on the fun? This is why, she tried and after Dora scared her half to death, by pouncing on her like a maniac, she retreated to the window to watch with wide eyed fear. 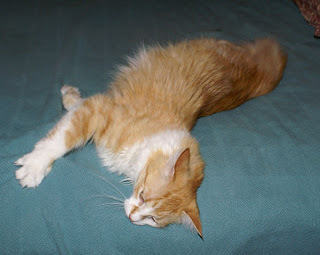 Once she had the bed to herself, Dora grabbed, crawled, rolled and flipped herself around the bed. This goes on until it really hits her and now shes saying; " I am really going to have a bad hangover tomorrow, I am going to bed." I finally got around to finishing off my newest punch needle piece. This may be my last for awhile, we shall see. I am working on a quilt challenge that is due next week and punched pieces for Lynette Anderson that are due in two weeks for a new book she will be show casing this year. After that, I will be working on more punched pieces for a book that will have quilting and punched versions of her designs, so hard to keep up with my sales too. The new piece will be for sale tomorrow night, on ebay. One of the projects I worked on that I couldn't show, was quilt blocks. They were made as part of a quilt, we made for a fellow quilter who is going through some tough times. I made two blocks for the quilt and we all sent them to another girl who pieced the quilt and then it went onto another, who did the quilting and binding. They did a beautiful job on putting it all together and today it arrived to it's destination. 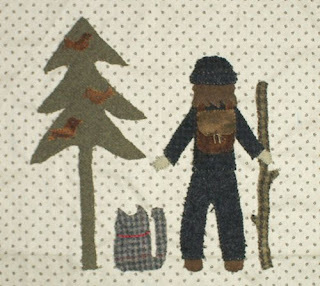 If you would like to see the whole quilt, you can visit Nancy's Blog to see all the other wonderful blocks in the quilt. 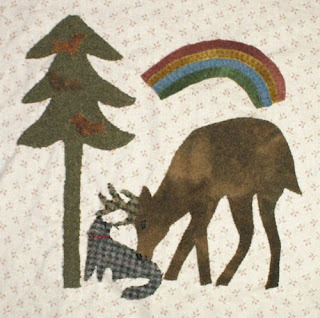 The theme of the quilt was nature and wildlife, so each block in the quilt depicts various pictures of things Nancy and Jim love. This block I made from a photo she had. She lives outside of Yellowstone park and has frequent visitors. The photo was of her cat and a deer, kissing. I just had to make it into a block. I added the rainbow from something I read about her loving the rainbow poem. The second block was from my memory of a picture I had seen of her husband Jim, who was standing in the yard watching something and the kitty was sitting beside him. He also loves the outdoors and outdoor activity and even though he cannot do these things now, I had him hiking with the kitty. 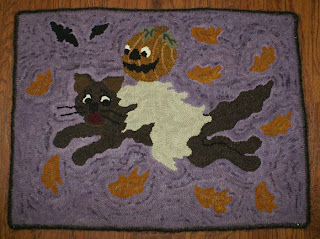 I thought you might like to see the original rug I did for this pattern. This is a large rug, took me a few months to hook this one. I also hand dyed the background, 3 times to get the right shade of purples. Of course the camera is not showing it properly as with the punched piece. My camera just doesn't know what to do with purple shades. 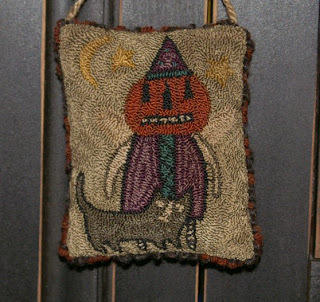 I tried selling this rug, but I wanted too much, I guess, so it stayed with me. Sometimes I just cannot let things go on ebay bids. 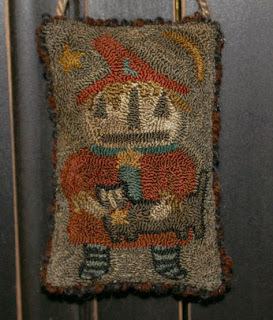 Sometimes I feel so bad when I see rugs and punched pieces go for nothing on ebay. I know the time and materials that go into our work. I mean, would you work for 3 days, for 20$, now that is sad. Or the fact that someone will pay hundreds of dollars for a used box of french fries and not pay a fair price for a hand crafted work of art? I really would like to have a site for hand crafted art, a gallery type website with the best in primitive crafts. I have thought of doing one, but I just don't have the time and my web building software is outdated. So, that is my complaining for tonight and why I stopped making rugs for sale. Now onto the rug, I hope you enjoy it, it is a fun rug. I had to lighten the image, so you could see the details on the colors that were too dark. The purples are richer and darker, as well as the leaves. I decided I wanted to do my Ghost Rider in a punched design. I have this rug in my hooking room, I could never get the price I wanted, so kept it for me;) But, I will sell the punched version, on ebay, tomorrow. I will try and put my new pieces up, a day ahead, so those of you who would like to make an offer, can do so, before I list it. Only serious offers, please. I made this one into a pillow without a hanger, I think it looks great sitting with a display to show off the design. 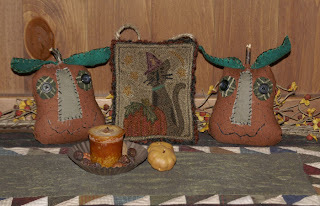 I used some variegated linen threads on the ghost and pumpkin's head. I love those two shades in the linen. 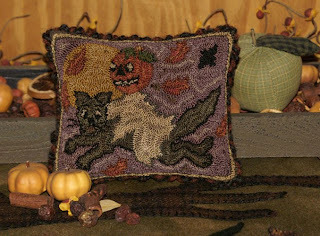 This is also a pattern in my ebooklet if you would like to make your own punched piece or hooked rug. I modified the original to make this new piece. 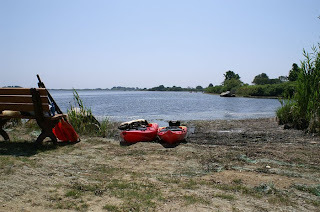 Today was definitely hot and we paddled and we stopped a lot to jump in the water. 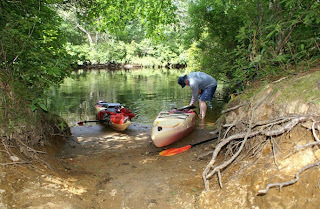 We stopped and swam at one place and played with two dogs whose owner was enjoying an unused camp that is in the area. We made our mid stop at the old campground. It has been closed for years since the state does not want to pay people to watch it. 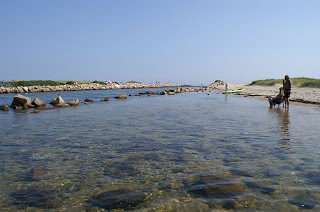 The last time it was open, someone started a bad fire, so now it is a place to stop and enjoy a nice swim and picnic. 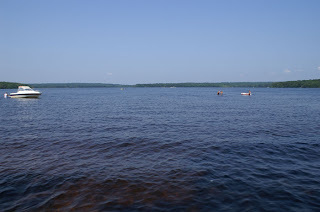 We paddled the entire lake today, from one side to the other, going into every cove. I think we spent more time in the water than on it, though. Now it is time to get back to work and finish up my projects this week. Today we finally got to go to the new launch on Ninigret. We go there often for walks and it is a beautiful place that the state took over and made into a wildlife sanctuary. 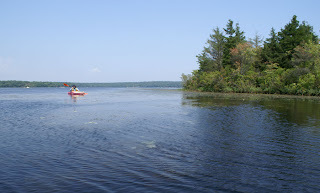 The pond is actually big, and it is state park and private homes, so lots of nice areas to paddle. 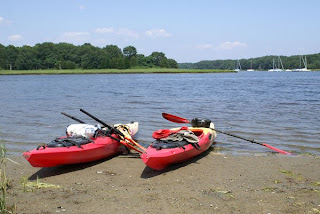 The tide was still low, so the launch was mushy marsh and stunk, lol. Bill had to push me out since I would have gotten stuck in the muck. I have carbon paddles and you do not use them for pushing. They are lightweight so perfect for me on long paddles, but they are more delicate and I do not want to damage them. The launch is in a protected cove and then it opens up into the main pond. 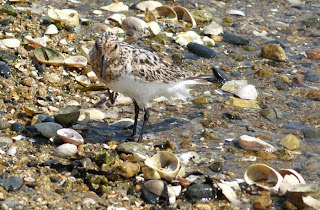 We stuck to the shoreline and I loved seeing the comorants on the rocks and in the water you could see the crabs scurrying around. 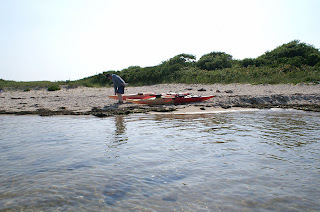 We paddled along the shore and then came back a bit to cross over to the other side. 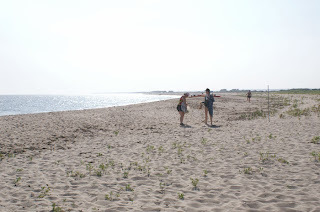 We wanted to find a place to land and cross over the dunes to the ocean. But, all the areas would mean lugging our boats down paths and then across to the beach areas, so we gave up on that idea. The water was teaming with Jelly fish, so I would not swim in that section. 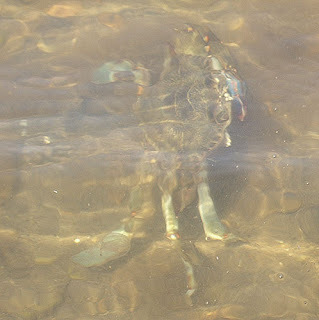 There was a huge Blue crab, but he would stay still and sped along the bottom, sideways. With the bright sun and the water movement, it was hard to get any good pictures of the creatures living under the water. We decided to head for the breakers and take a break there. 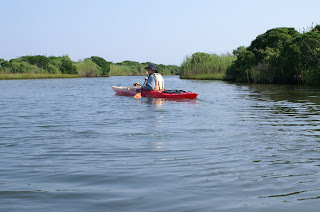 We paddle back down and found the cove, well we thought we did. We noticed it was awful low and wondered how a big boat could get down this way, and we should have known, it was a dead end. But, it was a pretty area anyways. This is the real breakway. This is where the boats come in and out of the pond to and from the ocean. The tide was coming in, so the current was strong. 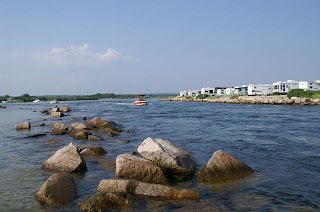 I stayed on the side until we came to the rocks and then dragged my boat to our spot. Here is where we stayed for a bit, nice and sandy and a little rocked off area to take a cool dip in. It also had a nice view of the entrance so we could watch the boats coming and going. I walked over the dunes and you could see the ocean from there, but the island was hidden with fog today. 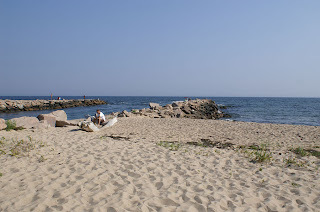 A few people were enjoying the beach, but it is not crowded on this side, which is nice. This is the view looking down the beach. 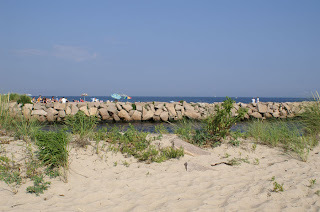 It is a really long beach, about 3 miles long. The only way to get to this end is down a bumpy dirt road, so most people stay at the farther end. 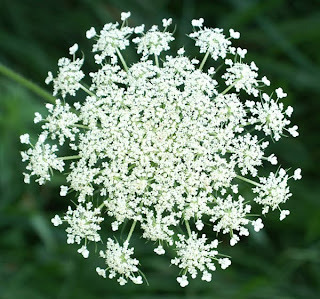 I was reading Sue Spargo's blog and she challenged herself to find circles and take photos. So, I got the idea to go outside and find circles. I found that I have a very boring yard, lol. There were circles if you want to count old tomato holders, plastic pipes in the back and old tires;) I did find a few circles that were worth showing and it is a good exercise in form and texture. I need a macro lens on this camera and I can't find the cord to my other, so not the best close ups. This is my favorite, it is a circle and a study in form, would make a very intricate pattern. We have tons of these growing in our yard, I have no idea what they are. I think everyone has these growing in the yard. 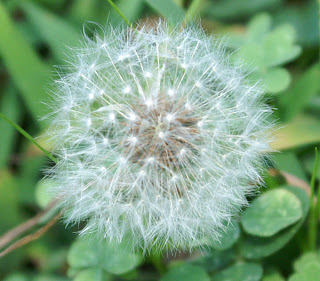 They are weeds, but I like them and they are fun to blow in the air. This is sort of a circle. 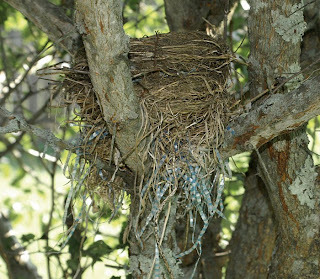 The birds have built multiple nests in this tree, this is the biggest and most well built. They must have had a party when the babies flew out of the nest;) It shows you, that birds will put anything in their nests. I decided to try a new version of the pumpkin angel and added the sitting cat that robin did in another graphic and a long pumpkin. I used a hand dyed floss on the face, it was green and dull orange, so it worked up nicely. I forgot to reverse the design though, so the kitty and pumpkin should have been on the other side. I am directionally challenged;) This one will be on sale, as well, on wednesday. Now I need to get moving on my quilt challenge and some new designs for lynette and a million other projects I want to do. 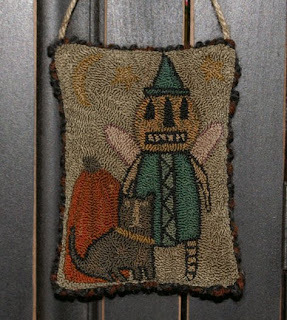 I will also have the pattern for the witch, for those that asked, later this week. Today it was cloudy with a chance of showers or thunderstorms later in the day. 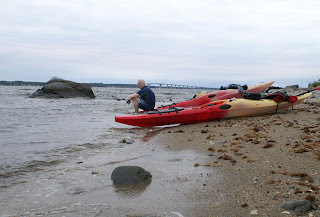 We decided to stick close to home and go out from the town launch and paddle up the bay for a bit. 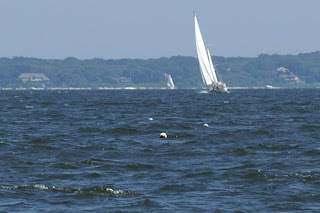 It was a bit windy and the minute we hit the breakers, it is wind and rocky waves, as the tide was doing out. I was a bit nervous around the breakers, the water there tends to go in and out at the same time so it can be a balancing act at times. We went into the next cove where our town beach is and this boat was just coming in for the day. 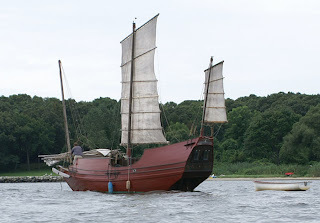 It reminds me of a pirate ship, very neat and the sales are even ragged looking. Once we got past that cove we went along the points and coves and stayed in the main water, pushing against the winds and waves. It is up and down and into troughs, but it is fun, I love rolling in the waves:) As you can see from Bill, you go into the troughs and come up with the next wave. 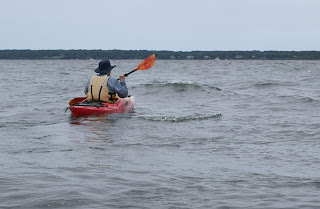 It is hard to show how it really is without being in it, but an outgoing tide and incoming winds can make for some interesting paddling. 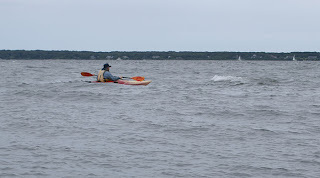 I admit, it was tough and I got tired and my rib was killing me, so we gave up at Rome Point and sat there a bit to enjoy the nice breeze. Bill is enjoying his spot on the boat, with a great view of the bay. I sat on a rock with a view of the opposite side of our point. We usually go around the inside of this point and go for a swim, but the water is still frigid and I was content to just dip my feet in. Yes, I am making a face. Of course he finally took the picture when I said, did you take it yet, lol. I can't believe I am letting you see this, haha. Going back was much easier, just going with the flow and keeping the boats straight. 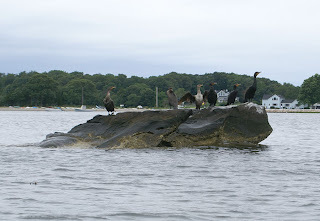 We went into one cove and here the comorants were enjoying a day on the rock. 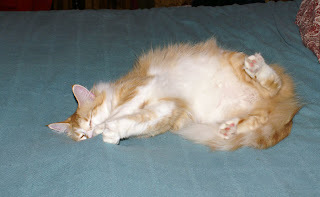 When I got home, I took a nice hot shower to get the salt off of me and then crashed for the rest of the day;) I am working on a new quilted project for a challenge, so when it is over, I can show it to you then. Today was a beautiful day. 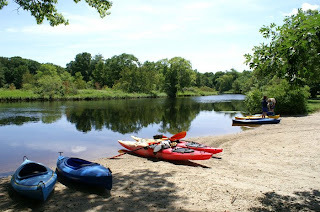 The sun was out and it was warm but we had a nice breeze, so it was a perfect day to paddle on the river. We went from the Bradford boat launch, and went up river. 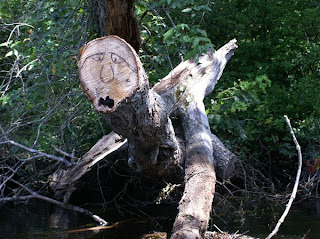 You never know what you will find along the river banks. A lot of blow downs from the storms we had this year. 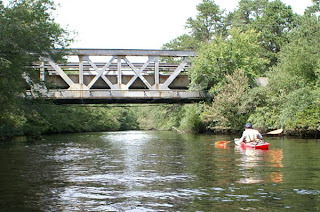 The river is very windy, going up and down and back up again, so we pass under two railway bridges. 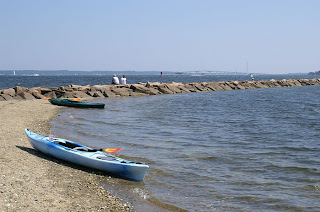 We paddle and make our first stop at the Burlingame campgrounds for paddlers. 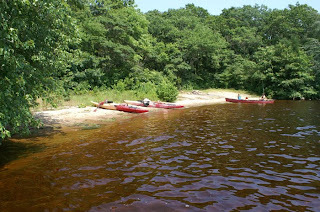 There are several campgrounds on the hills and places to bring in your boat and take a swim, great place to cool down. 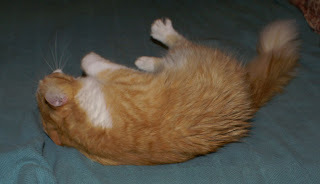 Today I wasn't hot enough to jump into the icy water, so I just dipped my feet in a bit, to cool down. We end the paddle at the falls in a little old town called Burdickville. The river goes on and on, but I was happy with stopping there, since we still had to paddle back. 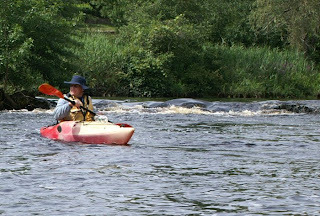 Bill played in the rapids below the falls, they propel you down the river which is fun, but I told him, he could not go over the falls, lol. I could just picture him smashing into the rocks and tipping over. 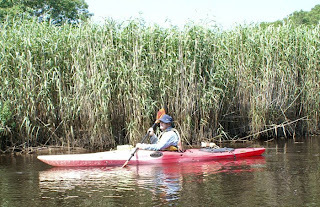 From there we paddle back to the launch, with the current, so it is nice after a hard paddle upstream. 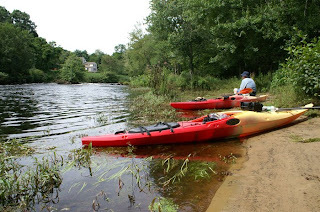 If you ever want to paddle in Rhode Island, there is a great site with launches that you can use, in the state. I really need to practice making dolls, lol. I found this free doll on the web, from Little Missy Primitives. 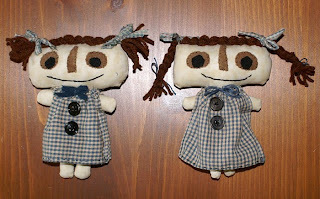 They are for a project called Comfort Dolls, a group that sends little dolls to women's shelters. A woman in one of our groups is heading ours and I volunteered to make a couple, from ugly to crazed, these dollies might really scare the heck out of the recipients. I realized I forgot the eyelashes, that might help. Another thing is, I wanted to add little wings to the back, but mine are not working out the way I wanted. If I use thin fabic it doesn't hold on its own and I want them to attach to the back, so not heavy with batting. I made one pair with ticking and a piece of batting, but then they would not come out at the tips and using a needle just wrecked them. So, any ideas of wings I could use to make them easier? Would love suggestions. I guess I could pull out my old books, I have a few for doll making, so wings must be in one of them. I had so much fun doing Robins design in punch, that I had to do another. This was one of her older freebies and luckily I had it printed out and saved in my files. This one came with the kitty so how could I resist. You can find Robins designs at Bird In The Hand Primitives. She also has some wonderful patterns that would be fun to do for the upcoming seasons. If you look closely, you can see his straw hair. I did that and the ones in his sleeves with a 4 height to raise it above the rest. This one is also up for sale, as well as the pumpkin angel. I am offering reduced shipping if you win both. I have to admit, I love freebies on the web and I love the fact that so many great designers offer designs for us to do. One person who does wonderful folk art is Robin of Bird In The Hand Primitives. I added the kitty from another of her doodles, of course I had to add a kitty;) I will be offering this piece for sale on ebay, not sure if I will do it tomorrow or wednesday. I also started another of her designs that she offered, so I will show you that when it is done. I wanted a brain break this week and it is fun making punches from such a great designer. We decided to stick close to home and paddled from our local launch. 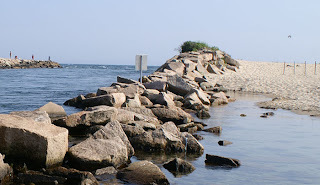 It opens into a large cove and goes out to the breakers and bay. 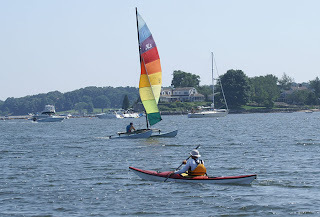 It was the perfect day for paddling, warm sun and cool breeze. 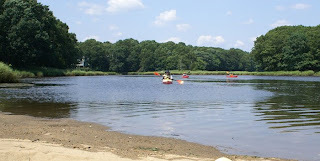 This is a great place to launch, lots of parking spaces and a nice sandy spot to take the boats out. The first thing I had to see, was the hawk who lives on one of the islands. 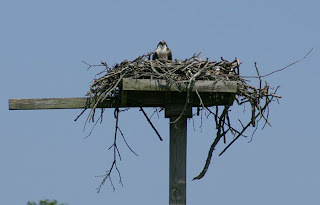 He was being very vocal with all the paddlers drifting by her nest. Rounding the island, we enter another cove that narrows down to a dead end. At the end, it is filled with reeds, that have grown, sky high. It reminds me of "The Land of the Giants". 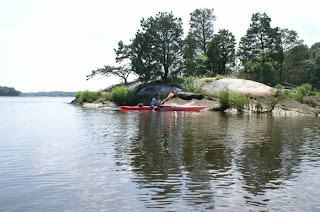 There is even a tiny island in the middle of this area. No spots to land though, but would be great for a picnic. We ended our paddle at the breakers. Here is the entrance to the bay. It was a bit windy and wavy, but I do love to ride the waves. We stayed here a bit before heading back. 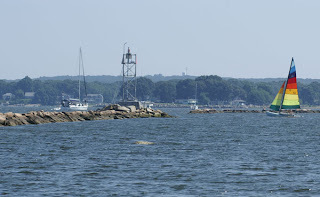 We took a swim, watched the wildlife and enjoyed the boats sailing and coming in and out of the harbor.